Wolfgang MetallWerk™ Aluminum Polishing System is the first complete polishing system we have ever offered for bare aluminum. With premium German-milled abrasives in each jar, Wolfgang MetallWerk™ metal polishes eliminate oxidation and stains to uncover a bright, mirror-like shine. Among all the metals used in the production of automobiles, aluminum is among the most challenging to maintain because of its lack of a coating and tendency to oxidize. Oxidation appears as a cloudy, white, chalky coating on the metal. The only way to remove the oxidation is by polishing. 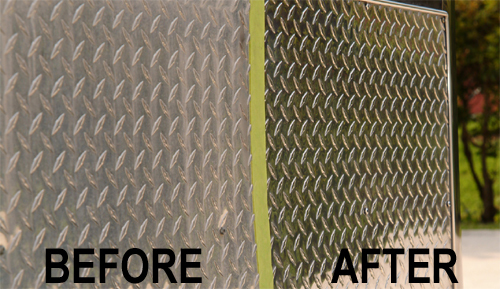 Removing oxidation from neglected aluminum requires an intense abrasive polish. A polish that consists just of solvents is not effective because the surface of the metal has changed from smooth and shiny to chalky and uneven. The process of polishing aluminum is exactly like polishing automotive paint: start with the most aggressive product and work with progressively less abrasive products until you have completely restored the shine. The Wolfgang MetallWerk™ Aluminum Polishing System provides a complete four-step process to clean, polish, and protect aluminum surfaces. Wolfgang MetallWerk™ Fine Aluminum Polish is an incredible metal cleaner and gloss-enhancing polish to remove light imperfections on uncoated aluminum and other polishable metals. Ultra fine abrasives restore a brilliant, like-new shine on bare metals, chrome, and stainless steel. For automotive metals, Wolfgang MetallWerk™ Fine Aluminum Polish is the best all around metal polish to restore a bright, metallic gloss. Wolfgang MetallWerk™ Concours Aluminum Polish achieves the maximum level of shine possible on aluminum, chrome, stainless steel, and bare metals. As the last step of the Wolfgang metal polishing system, Concours Aluminum Polish creates a brilliant, mirror finish that is sure to draw attention. Once you’ve achieved a mirror-like gloss, seal and protect polished metal surfaces with Wolfgang MetallWerk™ Concours Metal Sealant. This acrylic metal sealant eliminates polish residue for a cleaner, clearer shine that lasts. This sealant forms a top coat over all types of metal that blocks out moisture and air so it cannot change the surface of the metal. Metal surfaces remain clean, polished, and mirror-bright for months. Germany is the source of some of the best abrasive products in the world, primarily because the country is the hub of Europe’s mineral processing industry. German car polishes and metal polishes are highly regarded and very effective because the industry is closely regulated by the German Abrasives Association. For Wolfgang MetallWerk™ polishes, we used only German-milled abrasives for the optimum uniformity and consistency in each batch of polish. 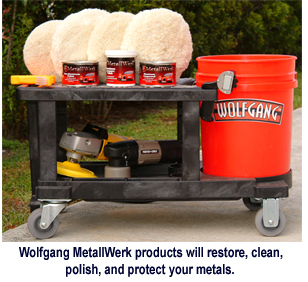 In addition to superior polishing agents, Wolfgang MetallWerk™ metal polishes have an ammonia base that is proven to effectively remove aluminum oxidation and stains from weathered aluminum and other bare metals. 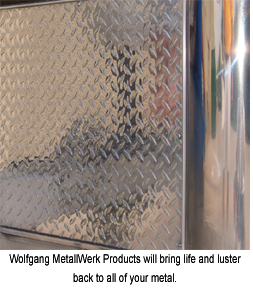 The Wolfgang MetallWerk™ Polishing System is effective on all bare metals including aluminum, copper, brass, stainless steel, and magnesium, as well as chrome. Restore the shine to aluminum trailers, wheels, bumpers, trim, boats, and aluminum airplanes with the Wolfgang MetallWerk™ Polishing System. 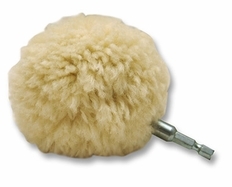 These polishes are designed for application with a dual action or rotary polisher. We’ve worked with Lake Country Manufacturing to develop wool pads that work with Wolfgang MetallWerk™ polishes to get the optimum performance. 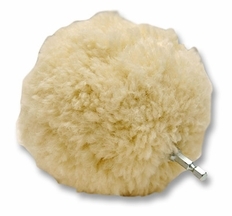 Wool’s natural tendency to shed lint continuously renews the pad’s surface to maintain the pad’s cutting ability. 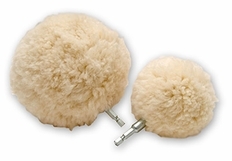 Three types of wool correspond to the three Wolfgang MetallWerk™ polishes. Apply Wolfgang MetallWerk™ Concours Metal Sealant with a foam finishing pad.